MADRID (Reuters) - Spanish lawmakers on Wednesday overwhelmingly approved a new law paving the way for Prince Felipe to be crowned king on June 19, despite calls by some political parties for a vote on the future of the monarchy. King Juan Carlos, 76, said last week he would hand over the crown to his son after almost four decades on the throne. His surprise abdication set off a debate in Spain about the royal family's role and forced parliament to speed through legislation to enable a succession. Juan Carlos, who has had health problems and walks with a cane after multiple hip operations, lost favour with Spaniards in recent years after a series of scandals involving his family. The once-popular monarch played a key role in Spain's transition to democracy in the 1970s after a long dictatorship. But he had seemed increasingly out of touch with recession-hit Spaniards in recent years. The vast majority of members in Spain's Congress, the lower house of parliament, voted in favour of the law, with 299 voting 'yes', 19 voting 'no' and 23 abstaining. It now passes to the upper house, the Senate, for final approval. The law should be ratified on June 17, according to parliamentary sources. 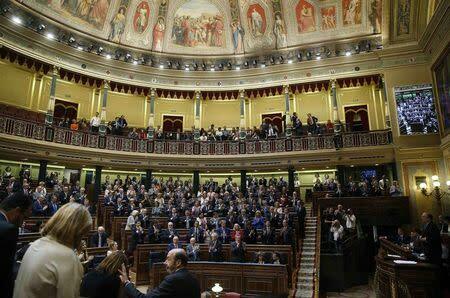 Juan Carlos will sign the legislation once it has been voted on by both parliamentary houses. Felipe, who has a better approval rating than his father and has not been tarnished by corruption allegations in his family, is expected to be sworn in on June 19 in Congress, in front of members of parliament. He will be accompanied by his wife, Letizia, and their two daughters in an austere ceremony to which no foreign dignitaries have been invited. He will not wear a crown or carry a sceptre, although these symbols of monarchy will be laid out during the event. Some political parties, including left-wing Podemos, which gained ground in Spain during recent European elections but does not have a parliamentary seat, had called for a referendum on whether the country still needed a monarchy. Thousands of people across the country have held rallies in recent days, calling for a republic. An opinion poll published on Sunday in El Pais newspaper showed 62 percent of Spaniards would favour a vote on the country's model of government. But at least for now, 49 percent also said they favoured a monarchy with Felipe VI at the helm, as the 46-year-old Prince will be known. Only 36 percent said they wanted Spain to become a republic.